Why Do We Write Memoir? Because it’s the hottest new upcoming genre on the publishing scene? Perhaps. God knows writing about one’s own self is nothing new, but memoir has been very popular for about the last ten years. Recently James Frey famously taught us that labeling fiction as memoir can make your work more interesting and publishable. But not everyone is as mercenary. Listening to a broadcast on NPR earlier this month, I was astonished to hear the family of a former slave discuss their ancestor. 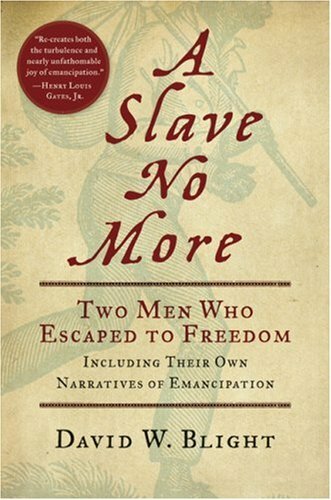 The radio show featured David Blight’s new book, A Slave No More, which includes two never before published escape narratives written by former slaves. To celebrate the stories coming to light, the show invited three generations of Washington’s–descendants of one of the authors–to discuss their ancestor’s story. Okay, fine. But here’s the astonishing part: Until Blight approached them, they had no idea their ancestor was a slave. The whole story was news to them. News to most of the people in the family. A family secret, even to the family. Discussing the reasons why the manuscript may have been hidden, the eldest Washington (granddaughter to the author) mentioned the stigma of being a former slave, of their earlier generations wanting to put those years behind them. Thirty years past the Civil Rights Movement, this stigma seemed a little odd, especially now that we celebrate these types of narratives. This former slave probably had little formal school. His family didn’t want him broadcasting his past. And even though he had written his story after the Civil War, he was still writing in a hostile world, with the odds decidedly against him. But he found the time and inclination to write it all out. Maybe he just wanted to leave a record for his ancestors. Maybe he wanted to better understand his journey. Or maybe he just new it was a good one. Too good to let go to waste. The fact that he, the former slave, could write at all, considering that it was a crime for a slave to be taught to read and write, is amazing, and a testimony to the power of the human spirit. Interesting, Tim. Good point, Ruth! Both the people who wrote these narratives were taught to read and write by their mothers, who in turn were both eventually rescued (perhaps even retrieved out of slavery) by thier sons, after they had won their freedom.